Recognizing abuse is the first step in getting help for yourself or someone you know. Domestic abuse doesn’t just mean causing physical pain. It can be emotional, sexual and economic in nature as well. It can be caused by a husband, or other relative. Similar abuse also happens in dating relationships. Learn to spot it, so you can end it! Domestic violence and abuse does not discriminate; it occurs within all age ranges, ethnic backgrounds, and economic levels. And while women are more commonly victimized, men are also abused—especially verbally and emotionally, although sometimes even physically as well. The bottom line is that abusive behavior is never acceptable, whether it’s coming from a man, a woman, a teenager, or an older adult. You deserve to feel valued, respected, and safe. There are many signs of an abusive relationship. The most telling sign is fear of your partner. 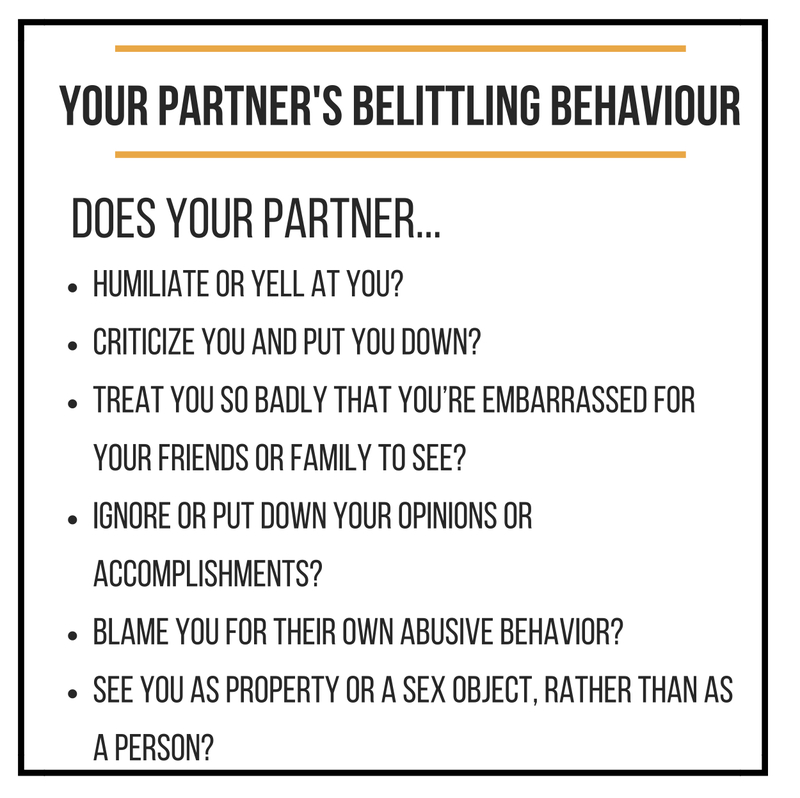 If you feel like you have to be on your guard around your partner—constantly watching what you say and do in order to avoid a blow-up—chances are your relationship is unhealthy and abusive. 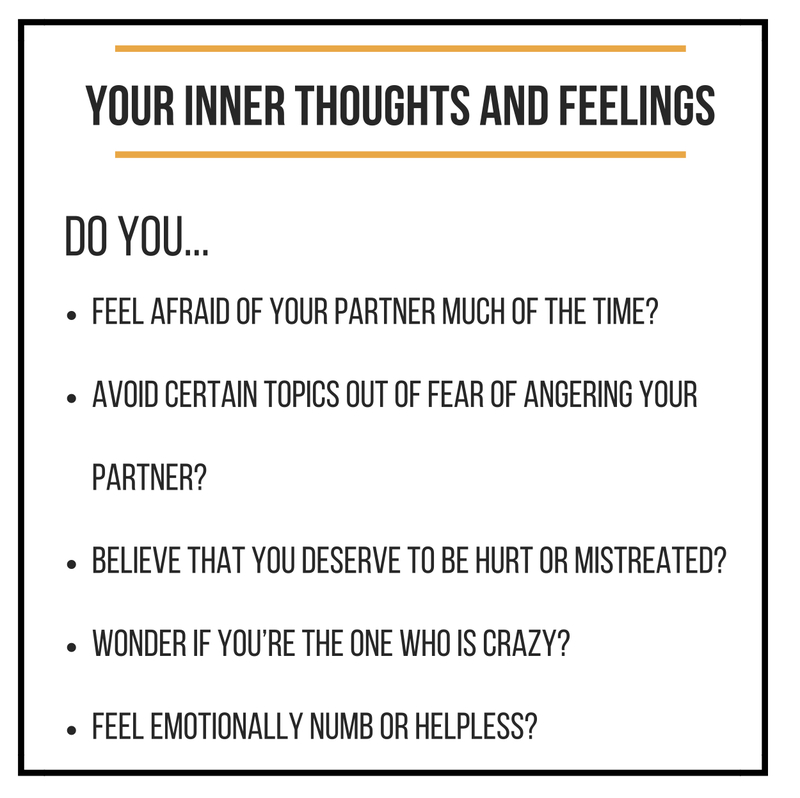 Other signs that you may be in an abusive relationship include a partner who belittles you or tries to control you, and feelings of self-loathing, helplessness, and desperation. Emotional abuse includes verbal abuse such as yelling, name-calling, blaming and shaming. Isolation, intimidation, and controlling behavior also fall under emotional abuse. 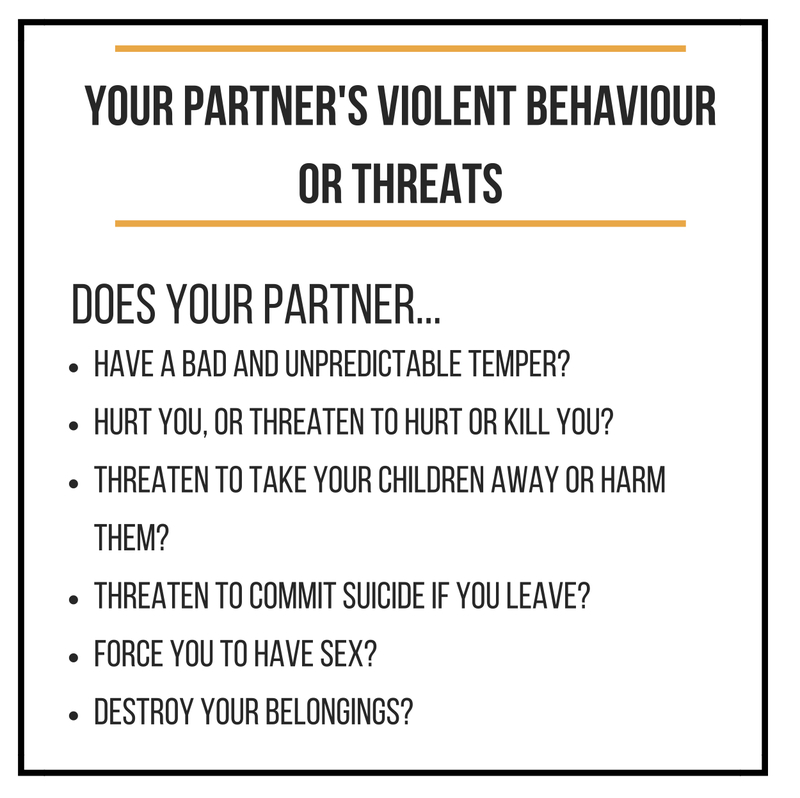 Additionally, abusers who use emotional or psychological abuse often throw in threats of physical violence or other repercussions if you don’t do what they want. 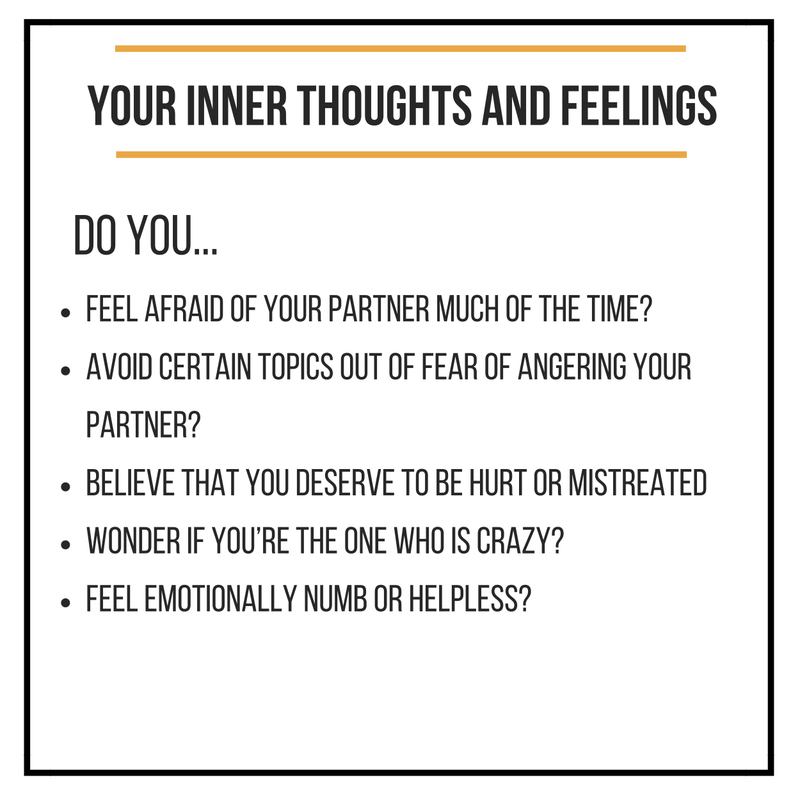 Guilt – After abusing you, your partner feels guilt, but not over what he’s done. He’s more worried about the possibility of being caught and facing consequences for his abusive behavior. 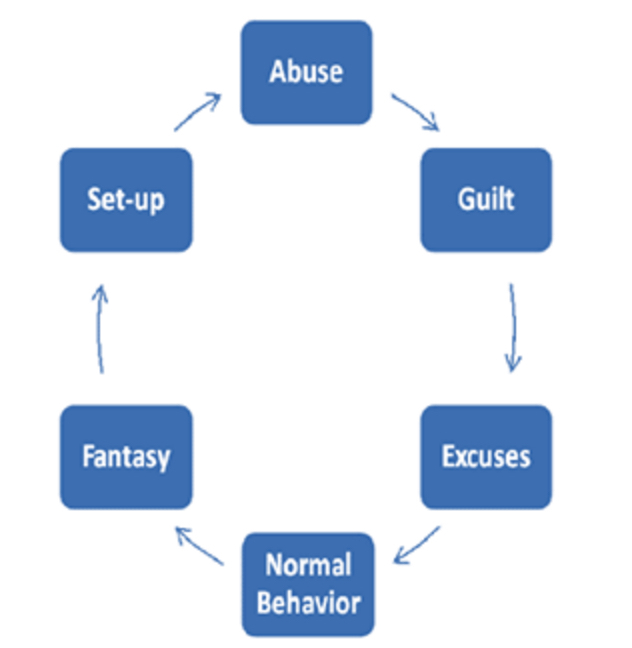 “Normal” behavior – The abuser does everything he can to regain control and keep the victim in the relationship. He may act as if nothing has happened, or he may turn on the charm. This peaceful honeymoon phase may give the victim hope that the abuser has really changed this time. Fantasy and planning – Your abuser begins to fantasize about abusing you again. He spends a lot of time thinking about what you’ve done wrong and how he’ll make you pay. Then he makes a plan for turning the fantasy of abuse into reality. A man abuses his partner. After he hits her, he experiences self-directed guilt. He says, “I’m sorry for hurting you.” What he does not say is, “Because I might get caught.” He then rationalizes his behavior by saying that his partner is having an affair with someone. He tells her, “If you weren’t such a worthless whore I wouldn’t have to hit you.” He then acts contrite, reassuring her that he will not hurt her again. He then fantasizes and reflects on past abuse and how he will hurt her again. He plans on telling her to go to the store to get some groceries. What he withholds from her is that she has a certain amount of time to do the shopping. When she is held up in traffic and is a few minutes late, he feels completely justified in assaulting her because “You’re having an affair with the store clerk.” He has just set her up. The content on this page was authored by the team at helpguide.org and edited by Operation PeaceMaker to adapt minor details to the Indian context. You are not alone. Get in touch and find out how we can help you.